The I-301 is a gift Rank I Soviet fighter with a battle rating of 2.7 (AB/RB) and 2.3 (SB). 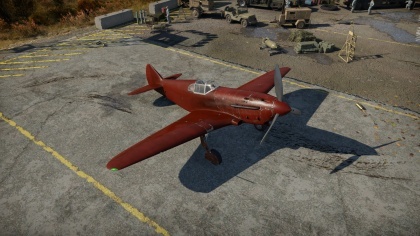 It was introduced during Update 1.43 as part of a giveaway in the 2014 Winter Holiday event and has been given away only as an event vehicle since. 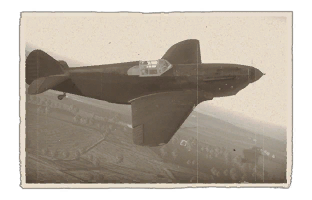 The I-301 is the prototype for the later LaGG-3 series, and as such, the flight characteristics are similar to the other planes in this series of aircraft. Besides being only marginally faster than the Rank III LaGG-3-66 in level flight and in a climb, the tactics proposed in the article for the LaGG-3-8 are told true, with the exception of the massive increase in firepower. With four machine guns and a cannon mounted in the V of the engine, the I-301 has one of the best armaments of any fighters around 2.7. In the hands of a skilled pilot, this plane can and will destroy whatever it goes after with near-impunity, its speed and climb rate being fairly well-suited for Boom & Zoom tactics. However, because it is essentially an up-gunned LaGG-3, it is still vulnerable to being set on fire pretty easily (with all the fuel tanks in the wings), the engine overheating rather quickly (a critical factor in realistic battles and simulator battles), and it can't turn-fight for long before slower, more maneuverable aircraft, can catch up to it and shoot it down. Similar to the Yak-3P, its only camouflage has a red finish, which can make it stand out in the sky, though unlike the Yak, the red finish is darker and less eye-grabbing from a distance in certain environments. In short, the I-301 is the grandfather of all the Lavochkin fighters. Its general flying style is almost identical to the production LaGG-3s, but with its five guns, it is very well suited for a more aggressive play-style. As such, going after more armored targets like four-engine bombers and attacker-class aircraft is viable in this aircraft, and being able to dispatch enemy fighters even in full up-tiers will be easy. The I-301 construction is similar to that of the LaGG-3 fighters, not too surprising considering the I-301 is the prototype of the fighter series. There is almost no difference between the I-301 and the in-game LaGG-3-8. The most distinctive feature of the I-301 is its complete dark red coat; given there are no other camouflage options, the I-301 is permanently linked with its red paint. The I-301 construction was wood and polymer, which contributed to its flying capabilities. Contrary to beliefs, the wooden construction was quite resistant to catching fire, but all the fuel tanks in the wings and fuselage are quite combustible. If one looks at the I-301 and compare it to other Soviet aircraft, there are some similarities due to features taken from other aircraft models. The fuselage was a similar construction of the MiG-3 fighters. The wings are similar to that of the Yak-1, the only difference being the I-301 wings are built in two parts, as evidenced by the bands in the middle of the wings. The I-301 firepower is a step above the other LaGG-3 fighters due to the extra machine guns and powerful cannon. The cannon is not the usual ShVAK (20 mm) seen on the production LaGG-3, but is a 23 mm PTB-23 cannon, which in-game is similar to the 23 mm on the IL-2 attackers, meaning they have great stopping power when it hits and can even be used against ground targets. As for machine gun armaments, all other LaGG-3 fighters had a single 12.7 mm UB machine gun as their secondary, the I-301 has two 12.7 mm and two 7.62 mm machine guns for a total of four. As mentioned earlier, this combination of nose-mounted armaments gives the I-301 great stopping power against its enemies. A good tactic for flying the I-301 is to climb above all your enemies, using your good rate of climb. Once at altitude, you can pick and choose whichever target you want to pursue. Once you pick out a target, dive on it and demolish the enemy with your deadly armament. It is very important to note that if your target turns, do not turn with it! Convert your speed back into altitude, and then dive back on the enemy aircraft. If you are playing in arcade mode, you will want to reload your cannon whenever your ammunition runs below about 25 rounds. Optimally you will be at bomber altitude, where you can take your time, reload and regroup. If you are flying in realistic or simulator, you will usually not have to worry about breaking up in a dive, tearing your flaps, or about ripping your wings; due to its construction, the I-301 is exceptionally tough. The I-301's roll rate and pitch authority are about average, but it has above average yaw authority. However, as you approach and go beyond 650 kph (400 mph) your control surfaces will stiffen up. Unlike the LaGG-3, the I-301 is equipped with four machine guns and a cannon that fires through the spinner, which gives this plane the heaviest one-second burst mass of any Rank I aircraft, comparable to planes up to two tiers above its rank. The massive amount of firepower can take down even higher-end tier IIIs and lower-end tier IVs if one is unlucky enough to have one in their six. As for ammo capacity, it carries a fair amount for its machine guns, carrying more ammo for its twin Berezin machine guns than the total ammo capacity of any of the LaGG-3s (cannon and machine gun combined); carrying enough ShKAS machine gun ammo equal to half the load of planes equipped with four of them such as the I-153 M-62 and the I-16 Ishak. However, the PTB-23 ammo load is abysmal compared to a load of a single VYa-23 cannon, in which it has only 81 rounds per before it needs to be reloaded. As with other planes with a multiple gun arrangement, Trigger discipline is the key to getting as many kills as you can before you run out of ammo for each gun. Since all the guns are center-line mounted, it is critical that your aim is on point before pulling the trigger in short, controlled bursts. In the end, the full salvo of five guns can quickly dispatch lightly armored fighters with ease, along with tearing through larger aircraft like bombers and attackers at a rather alarming rate. It is very comfortable at punching well above its tier, but because it is a prototype, it does not have any options for suspended ordnance such as rockets and bombs. To add, most of the time machine guns, if the aircraft has cannons, will all be paired together. With the I-301, it is different. The twin ShKAS machine guns are what fire when the machine guns key is activated while the twin Berezin UB machine guns and the PTB-23 cannon will fire if the cannons key is activated. P-47 - Unless catching one in a level altitude, the P-47 can maintain a very high speed and firepower to use when attacking. They would come in Boom-&-Zoom style onto the aircraft and even if they miss, they would zoom away with its speed, with the I-301 unable to catch it under its own speed. If they should conduct a mistake of engaging in a turn fight, the I-301 will dance all over the slowed P-47 and a good burst onto the fuselage can still tear apart a P-47. Try to catch the I-301 when it is engaging with another aircraft, namely when it is swooping onto a target or turning against a fighter. While it is preoccupied with trying to destroy the enemy, pounce on it and take it out quickly before the I-301 could react. As a premium vehicle all unlocks are already researched, bought and installed. Thus there is no way of receiving the research point bonus for buying all unlocks of a tier. This page was last edited on 14 January 2019, at 03:12.